Firefighters from several departments battled a pasture fire north of McDavid Monday afternoon. The fire on Dawson Road, just east of Highway 29, was reported just after 4 p.m. The fire burned about 15 acres of mostly pasture land. The first fire units on scene did work to keep the blaze away from a mobile home and six to seven vehicles that were threatened. The McDavid and Century stations of Escambia Fire Rescue and the Flomaton Fire Department responded to the fire. There were no injuries reported. Northview High School NJROTC Cadet Victoria Wright has been awarded the Air Force’s four-year Reserve Officers Training Corps (ROTC) college scholarship. 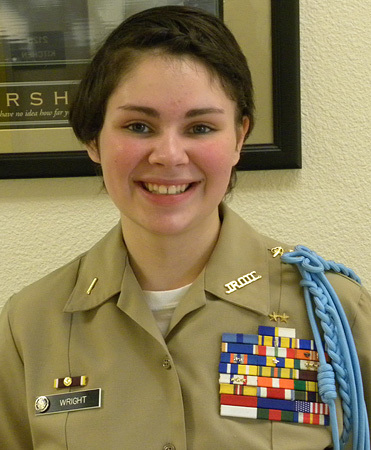 Wright has been a member and leader in the NJROTC unit at Northview for four years. Photo for NorthEscambia.com, click to enlarge. Construction of a westbound left lane from Nine Mile Road onto Louise Avenue (across from Winn Dixie) in Escambia County will begin the week of March 31. During construction the travel lanes will be reduced to ten feet through the area. Turn lane construction is anticipated to take approximately one month to complete. Construction activities may be delayed or rescheduled in the event of inclement weather. Motorists are reminded to travel with care through the work zone and to watch for construction equipment and workers entering and exiting the roadway. The Town of Century is asking residents to attend a meeting tonight to offer input into the town’s future economic development plans. A public meeting will be held at 6 p.m. at the Ag Building on West Highway 4 to give citizens a chance to offer their input into the plan. When Century updated its Comprehensive Plan in March 2012, the need for an economic development strategy was identified as one of the critical issues facing the Town. Last July, Century was awarded a $25,000 a Community Planning Technical Assistance Grant from the Florida Department of Economic Opportunity. The grant provided the town the opportunity to contract with the University of West Florida’s Haas Center to develop the plan. Meetings with the public, businesses and economic stakeholders were previously held. At tonight’s meeting, residents will have one more opportunity to discuss the plan’s vision, mission, objectives and goals. Century’s Economic Development Strategic Plan must be submitted to the Florida Department of Economic Opportunity by May 30. 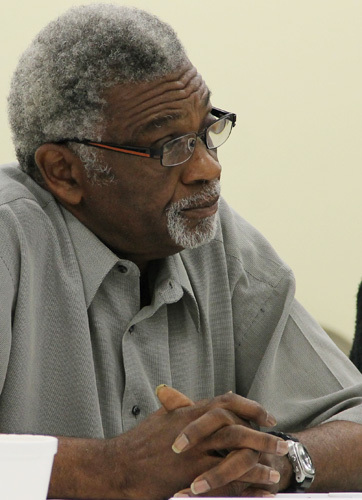 Picture top: Robert Mitchell (left) speaks as Century council member Gary Riley (right) listens during an economic development planning meeting in late January. Pictured inset: Resident James McMurray offers input at the meeting. NorthEscambia.com file photos, click to enlarge. Hattie Schneider of Molino is celebrated her 105th birthday Monday. She gives credit for her long life to “prayer and WD-40″. Hattie says she is not sure why she has lived so long or what God’s purpose is for her, but she has trust in the Lord. She has one son, Carlton Abbott, two grandchildren, and many great and great-great grandchildren. Her family and friends said they thank God everyday for blessing them with her, and she is a true inspiration to everyone. 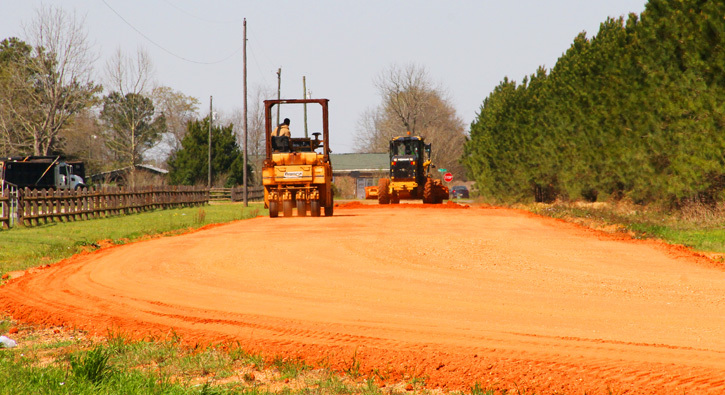 Work is underway to prepare for the paving of a ortion of Bratt Road from North Pine Barren Road to West Highway 4. A section of Bratt Road was recently surfaced east of North Pine Barren Road. NorthEscambia.com photos, click to enlarge. Monday Sunny, with a high near 77. Light and variable wind becoming south 5 to 10 mph in the morning. Monday Night Patchy fog after 1am. Otherwise, mostly clear, with a low around 46. South wind around 5 mph becoming calm in the evening. Tuesday Mostly sunny, with a high near 80. Light east wind becoming south 5 to 10 mph in the morning. Tuesday Night Partly cloudy, with a low around 53. South wind around 5 mph. Wednesday Mostly sunny, with a high near 79. South wind 5 to 15 mph. Wednesday Night Mostly cloudy, with a low around 56. Southeast wind 5 to 10 mph. Thursday Partly sunny, with a high near 80. South wind 5 to 15 mph, with gusts as high as 20 mph. Thursday Night A 20 percent chance of showers and thunderstorms. Mostly cloudy, with a low around 61. South wind 5 to 10 mph. Friday A 40 percent chance of showers and thunderstorms. Mostly cloudy, with a high near 81. Friday Night A 40 percent chance of showers and thunderstorms. Mostly cloudy, with a low around 61. Saturday A 40 percent chance of showers and thunderstorms. Mostly cloudy, with a high near 78. Saturday Night A 40 percent chance of showers and thunderstorms. Mostly cloudy, with a low around 58. Sunday A 40 percent chance of showers and thunderstorms. Partly sunny, with a high near 77. 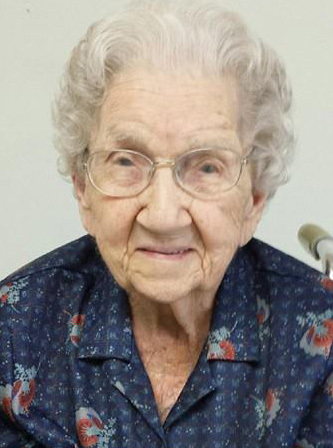 Evelyn Carr Shiver, age 95 of Cantonment, passed away on March 31, 2014. She was a former resident of Jay. She was a member of Cantonment First Baptist Church and retired from Harvesters Credit Union in Cantonment. Evelyn was a loving, caring and generous person. She was a loving mother, grandmother, sister, and aunt. She was preceded in death by her parents, John and Lola Carr; husband, Warren G. Shiver; one sister and four brothers. She is survived by her son, Fred W. (Linda) Shiver; daughter, Wanda S. (Randy) Clark; sisters, Velma Bradley, Thelma Wilson, and Pamela Murphy; brother, Horace Carr; five grandchildren; 12 great-grandchildren and numerous nieces, nephews and other relatives. A visitation will be held on Thursday, April 3, 2014, from 12 p.m. until 1 p.m. at Jay Funeral Home. Funeral services will begin at 1:00 pm. Burial will follow at Cora Baptist Church Cemetery. The family would like to thank Century Care Center and staff and Covenant Hospice for all their gentle love and support shown to our loved one. An early Sunday morning fire destroyed an unoccupied mobile home. The fire was reported at 2:25 a.m. in the 400 block of Garmo. Road, off Becks Lake Road. The mobile home was mostly involved when the first firefighters arrived on scene. Neighbors told firefighters that no one was currently living in the trailer. 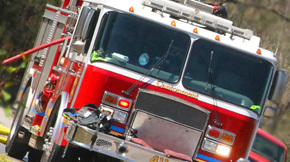 Firefighters were hampered by the physical location of the trailer in fighting the fire; it was located down a long narrow driveway that was inaccessible to large fire trucks. There were no injuries reported; the cause of the fire is under investigation by the Florida State Fire Marshal’s Office. Sunday Sunny. Highs in the lower 70s. North winds 5 to 10 mph. Sunday Night Clear. Lows in the lower 40s. West winds around 5 mph becoming northwest after midnight. Monday Sunny. Highs in the mid 70s. Northeast winds around 5 mph becoming south in the afternoon. Monday Night Mostly clear. Lows in the upper 40s. South winds around 5 mph. Tuesday Night Partly cloudy. Lows in the lower 50s. Wednesday Mostly sunny. Highs in the upper 70s. Wednesday Night Mostly cloudy. Lows in the upper 50s. Thursday Mostly cloudy. Highs in the lower 80s. Thursday Night Mostly cloudy. Chance of showers and slight chance of thunderstorms. Lows in the lower 60s. Chance of precipitation 50 percent. Friday Mostly cloudy. Chance of showers and slight chance of thunderstorms. Highs around 80. Chance of precipitation 30 percent. Friday Night Mostly cloudy. Slight chance of showers and thunderstorms. Lows in the upper 50s. Chance of precipitation 20 percent. Saturday Mostly sunny. Slight chance of showers and thunderstorms. Highs in the mid 70s. Chance of precipitation 20 percent.